Her name isn’t really Ricki Rendazzo. Ricki Rendazzo is a rock star alter ego; her thick eye make-up, leather pants and gaudy jewelry are shields from life’s many and varied disappointments. When Linda Brummel has to be Linda Brummel, like when she hands her ID to a security guard outside her ex-husband’s wealthy suburb, she seems embarrassed and defeated, like she’s forced to break character. To be Ricki, Linda had to give up a lot, including financial stability, her marriage and a relationship with her three children. She also has to grin and bear a job as a cashier at Total Food, a Whole Foods rip-off where people routinely spend as much on food as she makes in a week. Is all of this worth it? Does playing nightly at a California dive bar to a small crowd that loves you really count? If it’s not, Ricki (who is played by Meryl Streep, by the way) doesn’t seem to realize it, and part of what makes Ricki and the Flash work as well as it does is that it defines its protagonist in relation to her contradictions rather than trying to solve them. She’s a Republican rocker who disdains President Obama, though she moved to California to escape life in Midwest. She even has a tattoo of an American flag on her back with a “Don’t Tread On Me” snake over it, a tattoo that the artists whose songs she performs– Bruce Springsteen, Tom Petty, Lady Gaga and U2– would probably disapprove of just a little bit. Her political beliefs aren’t really expounded on, and manifest more through her behavior, such as the discomfort she feels around her sons (one is gay, the other an environmentally-conscious vegan), than through didactic conversations. 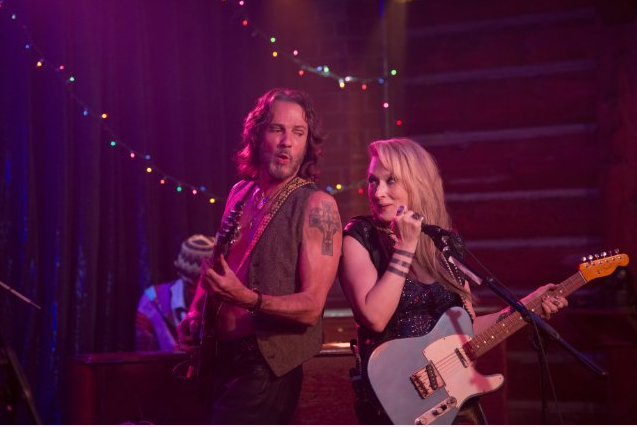 Ricki is drawn back to Indianapolis when her ex-husband (Kevin Kline) calls her to tell her their daughter Julie (Mamie Gummer) is getting divorced and not handling it well. She spends what little money she has on a plane ticket and returns home. In that way, she is quite similar to the last troubled protagonist written by Diablo Cody, Mavis Gary in 2011’s Young Adult. Both Ricki and Mavis’ delusions of success are shattered when they drag themselves back to old towns that dredge up the past. They’re aspiring artists who are doomed to mediocrity and know it. Cody finds comedy in the ways they lash out at the world, but Young Adult also showed a decidedly darker edge to her material, a middle-aged disappointment that only hovered in the periphery of her twee teen pregnancy comedy Juno. Ricki is an even more depressing character than Mavis because she has had more time to experience disappointment and rejection. She also has no real success to speak of, and is seen more as an embarrassment when she goes back to Indy than a local celebrity. Director Jonathan Demme is adept at defining the different behavioral codes that govern the movie’s two distinct milieus; the suit-and-tie, never-express-emotion-in-public folks of the liberal Midwestern upper class and the leather-clad, shout at the stage patrons of the conservative, working class bar where Ricki performs. Much of the movie’s conflict comes from the breaking of the societal taboos in the former location, not just by Ricki but by Julie, whose depression is so severe after her divorce that she refuses to shower or change her clothes. Streep and Gummer, who are real-life mother and daughter, have a natural on-screen dynamic. Their characters’ quiet, reluctant bonding in the middle of the endless judgmental stares from the people around are some of the movie’s best. Ricki doesn’t find out until she arrives back home that Julie actually attempted suicide in the wake of the divorce, and her efforts at helping her daughter regain her footing become a kind of redemption. 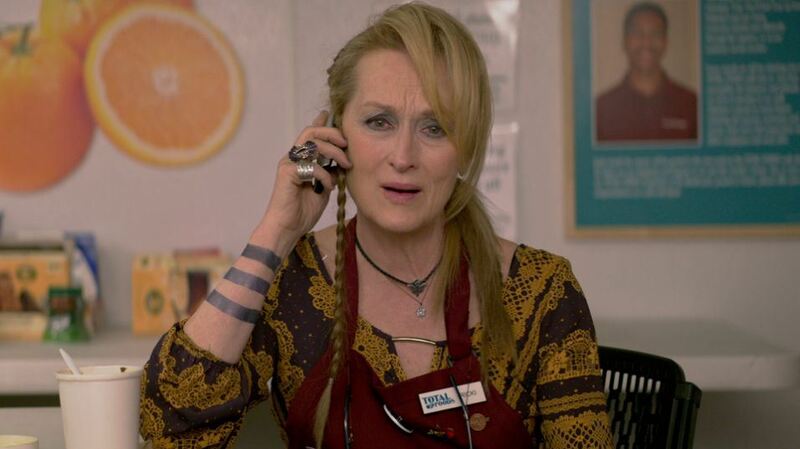 Streep delivers the line “Sometimes a girl just needs her mother,” as if Ricki is trying to convince herself of her necessity more than anyone else. By thrusting herself back into her old life, Ricki eventually finds some small form of victory while performing at her son’s wedding. She can’t afford a blender or a waffle maker, so she takes to the stage and performs Springsteen’s “My Love Will Not Let You Down.” Close-ups of unamused guests scowling or giving annoyed glances at the stage evolve into nearly everyone dancing with the bride and groom by the end. Demme even goes so far as to bring in people from the California bar who had no real reason or method of getting to the wedding. Those surreal final moments at the wedding feel a bit overdone; Ricki wins the bougie crowd over, causing her past and present lives to blend together and dance to her band’s performance. Her relationships with her children, which in earlier scenes were fraught with resentment, are almost completely healed. It’s an odd grand finale to a movie that is otherwise disarmingly intimate. This entry was posted in Uncategorized by matterspamer. Bookmark the permalink.